This isn’t Game of Thrones, but there really does get to be a lot to keep track of after a while. Walter’s friend Mickey, who drives Bobby Gallagher’s van — did I give him a last name at one point? If I did, I sure have no memory of what it is. How much detail have I provided for the Salvage Market? What’s the layout of Walter’s house in Louisburg Square? And what exactly have I said (and not said) about the war that landed everyone into this messy world in which the novels are set? So clearly I should create such a bible. But really, I rather be writing. So I guess I’ll just take my chances. 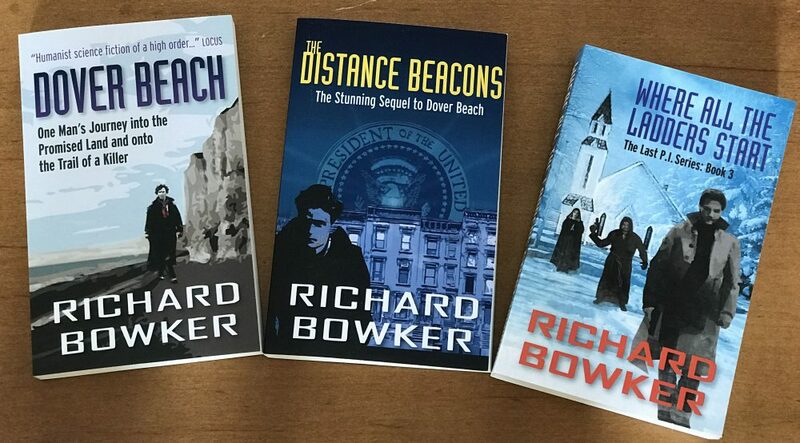 This entry was posted in Writing and tagged authors, books, fiction, novels, writing by Richard Bowker. Bookmark the permalink. Years ago, when I wrote short stories, I used a box of index cards. Now I use Excel. I have separate sheets in a workbook for characters names, character connections, plot points, timeline, scene details, etc. It would take a lot of work to do it it you wanted to just sit down and map it all out, but I just build it as I go so it’s relatively painless. A lot of folks are using Scrivener now. I’ve played with it and it really is a good tool, but to me it just formalizes what I already do in Excel. Different strokes for different folks, I suppose. But, I have to agree with you. It’s more fun to just write.